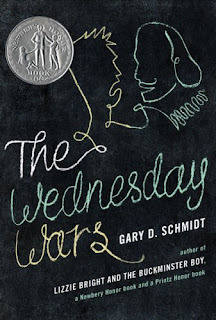 I adored Gary D. Schmidt’s Okay for Now, so was thrilled to learn that it was actually a sequel to The Wednesday Wars, a Newbery Honor book from 2007. It’s hard to say if I loved Okay for Now more because I read it first, but it doesn’t really matter because the original book is still brilliant. As the only Protestant in a class full of Catholics and Jews, Holling Hoodhood must remain after school on Wednesdays while the rest of his classmates leave early for their religious classes. His teacher, Mrs. Baker, doesn’t want him there, and the year is spent with her punishing him by making him read Shakespeare. If this sounds like a simplistic setting that is more appropriate for an Andrew Clements novel, don’t worry, because The Wednesday Wars addresses many of the major themes of growing up, using Shakespeare and the Vietnam War to add depth to the plot. There are many similarities between the two novels, apart from the setting and characters. Both involve the surprise revelation of a character’s name, both feature the same conversational tone, and both emphasize the development of sibling relationships during adolescence. Also, they are both simply awesome. I love that Schmidt can have me laughing over lines like, “Teachers don’t reckon time the way normal people do” and then welling up over a bittersweet moment. Most of all, I love that his writing can be used as a model for the work I do in my classes. Descriptive sentences like, “Think of the sound you make when you let go after holding your breath for a very, very long time. Think of the gladdest sounds you know: the sound of dawn on the first day of spring break, the sound of a Coke opening, the sound of a crowd cheering in your ears because you’re ahead.” These are the kinds of passages that I hold up to my students as a model for how to connect to readers. My students and I will aspire to write something as meaningful as The Wednesday Wars.